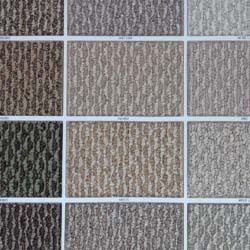 Berber carpet is a very elegant looking style of carpeting, and is one of today's most popular selling carpets. When buying Berber carpeting take note that the smaller loops get the best wear and tear. Berber style carpeting also, with its tight loops and very low pile does not show foot prints or vacuum marks. Many Berber carpets come in multi colors or patterns which can be helpful in heavy traffic areas and are good at hiding dirt, spills, or stains. The downside to Berber carpeting is that can be vulnerable to snags caused by the nails of dogs or cats. The large and small tufts of fiber make Berber carpeting comfortable under your feet, which makes it excellent for areas of your home that are used often and experience high amounts of foot traffic. Another advantage of Berber's loop construction is that it tends to resist crushing more, which can help hide marks from footsteps or vacuuming. Berber carpet's textured look enhances any style of home decoration – from traditional to contemporary – with a timeless look. It is available in a range of neutral color tones or flecked variations. Get a FREE CARPET ESTIMATE TODAY from a trusted local carpet dealer that specializes in Berber Carpeting.